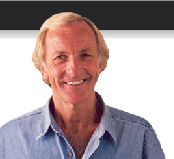 John Pilger was born and grew up in Bondi, Sydney, Australia. He launched his first newspaper at Sydney High School and later completed a four year cadetship with Australian Consolidated Press. "It was one of the strictest language courses I know," he says. "Devised by a celebrated, literate editor, Brian Penton, the aim was economy of language and accuracy. It certainly taught me to admire writing that was spare, precise and free of cliches, that didn't retreat into the passive voice and used adjectives only when absolutely necessary. I have long since slipped that leash, but those early disciplines helped shape my journalism and writing and my understanding of moving and still pictures". Like many of his Australian generation, Pilger and two colleagues left for Europe in the early 1960s. They set up an ill-fated freelance 'agency' in Italy (with the grand title of 'Interep') and quickly went broke. Arriving in London, Pilger freelanced, then joined Reuters, moving to the London Daily Mirror, Britain's biggest selling newspaper, which was then changing to a serious tabloid. He became chief foreign correspondent and reported from all over the world, covering numerous wars, notably Vietnam. Still in his twenties, he became the youngest journalist to receive Britain's highest award for journalism, Journalist of the Year and was the first to win it twice. Moving to the United States, he reported the upheavals there in the late 1960s and 1970s. He marched with America's poor from Alabama to Washington, following the assassination of Martin Luther King. He was in the same room when Robert Kennedy, the presidential candidate, was assassinated in June 1968. He has won an American TV Academy Award, an Emmy, and a British Academy Award, a BAFTA for his documentaries, which have also won numerous US and European awards, such as as the Royal Television Society's Best Documentary. The British Film Institute includes his 1979 film, Year Zero: the Silent Death of Cambodia among the ten most important documentaries of the twentieth century. His articles appear worldwide. In 2001, he curated a major exhibition at the London Barbican, Reporting the World: John Pilger's Eyewitness Photographers, a tribute to the great black-and-white photographers he has worked alongside. In 2003, he was awarded the prestigious Sophie Prize for '30 years of exposing injustice and promoting human rights.' In 2009, he was awarded Australia's human rights prize, the Sydney Peace Prize. He has received honorary doctorates from universities in the UK and abroad. In 2017, the British Library announced a John Pilger Archive of all his written and filmed work.